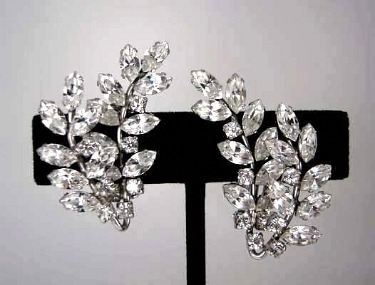 Do you collect vintage rhinestone jewelry? Then caring for rhinestone costume jewelry has been created especially for you dear reader; because the correct method of caring and storing rhinestone jewelry, will keep your Rhinestone jewelry in tip-top, sparkling condition. Keep in mind, that when you hear the term "paste" in jewelry, most likely it's referring to rhinestones. And when it comes to rhinestone costume jewelry, All That Glitters is Not gold but Sherman Jewelry! The following tips and techniques in caring for rhinestone jewelry applies to jewelry containing "paste" stones. If you are familiar with the History of Rhinestones, you are aware that the United States use the term "rhinestone" for these fiery little sparklers, while in Europe, "paste", "strass" and "diamante" are more commonly used. Rhinestones are man-made gemstones of highly refined glass. Just like when you care for pearls, when caring for rhinestone costume jewelry, do not spray perfumes, deodorants or hairsprays anywhere near this type of jewelry. The chemicals in the sprays may damage the stones. Do not store rhinestone jewelry on top of one another. The rhinestones, being made of glass may chip, break or scratch. Do not store rhinestone jewelry in plastic bags for long periods of time. Moisture may get trapped inside and destroy the rhinestones. Vintage costume jewelry is often made from a material called Pot Metal. It is a relatively soft compared to precious metals and care should be taken not to bend or crush it. Rhinestones are usually always foil backed. If you cannot tell if the stone is foil backed or not, better safe than sorry, err on the side of caution. Never immerse rhinestone jewelry in any kind of liquid. Never use toothpaste or a hard brush or any type of abrasive or ammonia based cleaner on rhinestone or crystal, in particular rhinestones finished with an opalescent coating that appears to give the stones a sheen and a color change appearance that is called - Aurora Borealis. To clean a piece of rhinestone jewelry, use a slightly damp soft lint-free cloth, and a small amount of foam glass cleaner, which is ammonia-free. With careful strokes, gently clean the surface of the stones. More information about caring for rhinestone costume jewelry can be found in Warman's Vintage jewelry by Leigh Leshner which can be purchased through Amazon.com by clicking on the photo of the book above on this page. If you are drawn to rhinestone costume jewelry or collect Sherman Jewellery then All That Glitters is another very useful guide that you should consider purchasing.